The new NanoMarkets report notes that worldwide capacity for OLED lighting panels is expected to be around 30 million panels and will grow to almost 40 million by 2019. 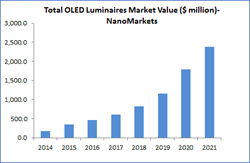 NanoMarkets predicts the OLED lighting market will approach $1.4 billion by 2019. Industry analyst firm NanoMarkets today announced that it has released slides from the recently released report, “OLED Lighting Markets-2014” that was issued in May of 2014. The report analyzes and forecasts the potential for OLED markets and continues the firm’s coverage that dates back to 2006. Details of the report, including a table of contents are available at http://nanomarkets.net/market_reports/report/oled-lighting-markets-2014. The slides can be accessed via: http://nanomarkets.net/Downloads/chapters/OLEDLighting2014CH1.pdf. Slides from the firm’s report on OLED materials markets is available at: http://nanomarkets.net/Downloads/chapters/ch1oledmaterials14.pdf. This report provides a comprehensive analysis of the OLED lighting market, assesses its future potential and offers detailed eight-year forecasts for the OLED lighting business including volume (units and square meters shipped) and value projections of the following market segments: designer kits and related products, office and commercial lighting, residential lighting, non-automotive outdoor lighting, automotive lighting and customized installations. The report also includes projections of manufacturing capacity for OLED lighting panels and an assessment of which geographic regions will prove the best customers for OLED lighting. In addition, we examine the product development and marketing strategies of the leading and influential players in the OLED lighting sector, including both large and small lighting firms and the key OLED material suppliers. Among the firms discussed in this report are Acuity Brands, Audi, BASF, Blackbody, BJB, Cheil/Novaled, Dupont Teijin, ETAP Lighting, First—O-Light, Ford, Henkel, Kaneka, Konica Minolta, Ledon, LG Chem, Lumiotec, MC Pioneer, Merck, NEC Lighting, OLEDWorks, Orbotech, Osram, Philips, Pixelligent, Samsung, Sumitomo, UDC and WAC Lighting. NanoMarkets tracks and analyzes emerging markets in energy, electronics and other area created by developments in advanced materials. The firm is a recognized leader in industry analysis and forecasts in OLED lighting and materials spaces which it has been covering since 2006. Visit http://www.nanomarkets.net for a full listing of NanoMarkets' reports and other services.